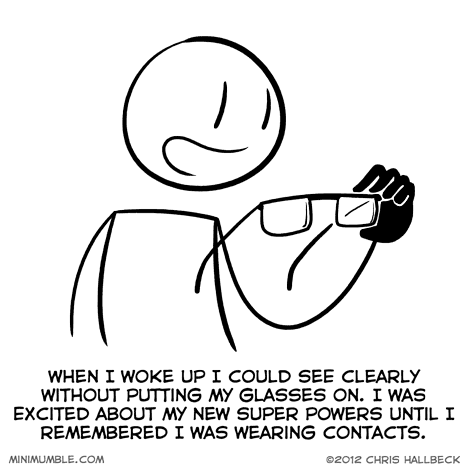 I first got contacts back in the late 80’s. The soft contacts were a different beast back then. I had a single pair that were supposed to last a full year. They had a daily and weekly cleaning ritual to keep them fresh. Every once in awhile I would fall asleep in them and would be confused when I first woke up and could read the clock across the room. I remember those contacts. But for me it was waking up and wondering who poured acid in my eyes while I was sleeping! Yeah, falling asleep with contacts means waking up with dry and agitated eyes. It’s not really possible to not realize I’m wearing them. Today, my glasses broke. Luckily, I had a spare set. I’m just too sqeamish about putting in contacts to ever get them, but if you ever have seen the real early versions, even the 80’s ones are light years more comfy I’d bet. I bought some contacts, but it takes me too long to put them in.